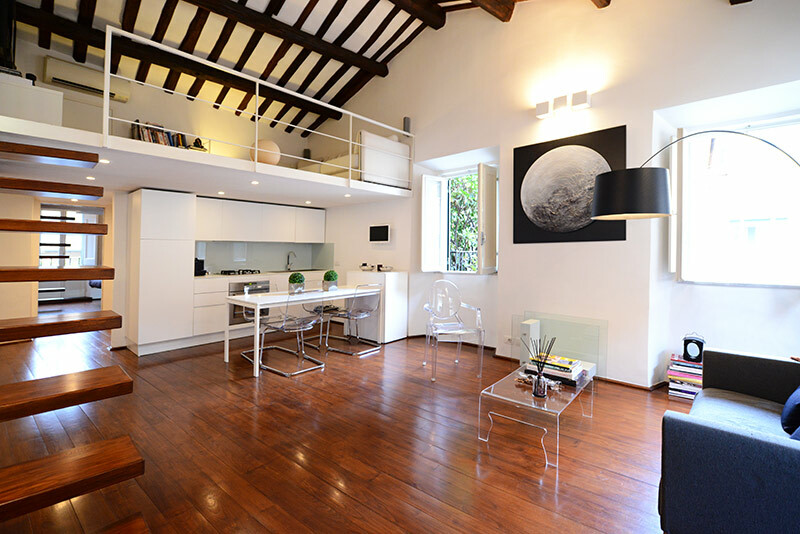 We can highly recommend the apartment in Trastevere. 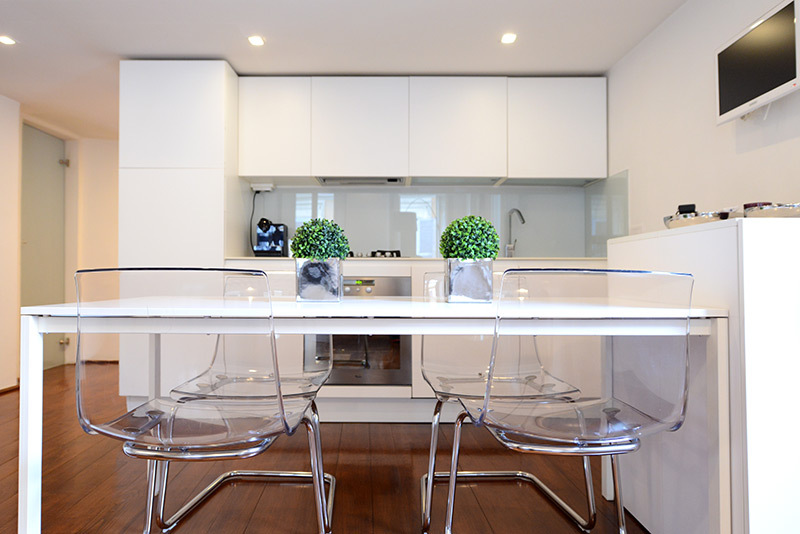 The location was perfect and the apartment was nice, clean and modern. The check in process was very easy. We loved our stay in Rome. Delighted with our apartment and location. Though six flight of stairs , you get fitter and have a laugh at the challenge.. Slight smell from bathroom and would like better quality linen. But overall it is an excellent apartment location and value ..
Sehr schöne, helle Wohnung im 4. OG. Zentrale Lage. Gute und viele Restaurants gleich nebenan. Sehenswürdigkeiten sind zu Fuß oder mit den öffentlichen Verkehrsmitteln gut zu erreichen. Kurz gesagt, einfach super und gerne wieder! Nur zu empfehlen. This air conditioned apartment is on the third floor of an 18th century building that unfortunately doesn’t have a lift. But once you enter the apartment, you’ll understand immediately that it was worth climbing the 3 flights of stairs! 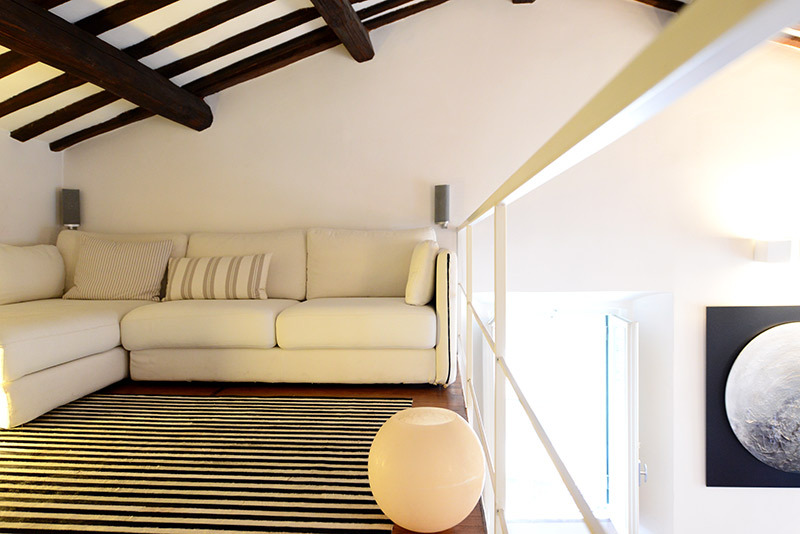 The living room is modern and stylish and sits on two different levels. 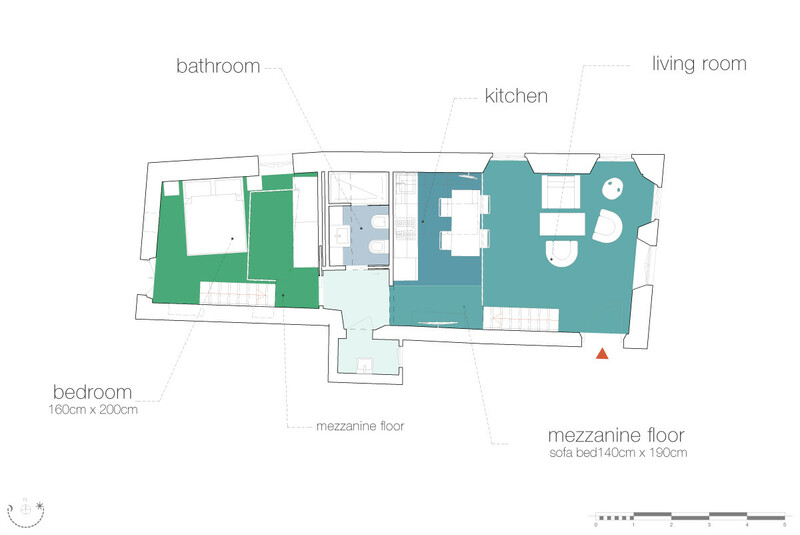 On the lower level, there is a comfortable sofa, a coffee table, a satellite TV, Internet access and a library. There is also a large dining table with chairs. 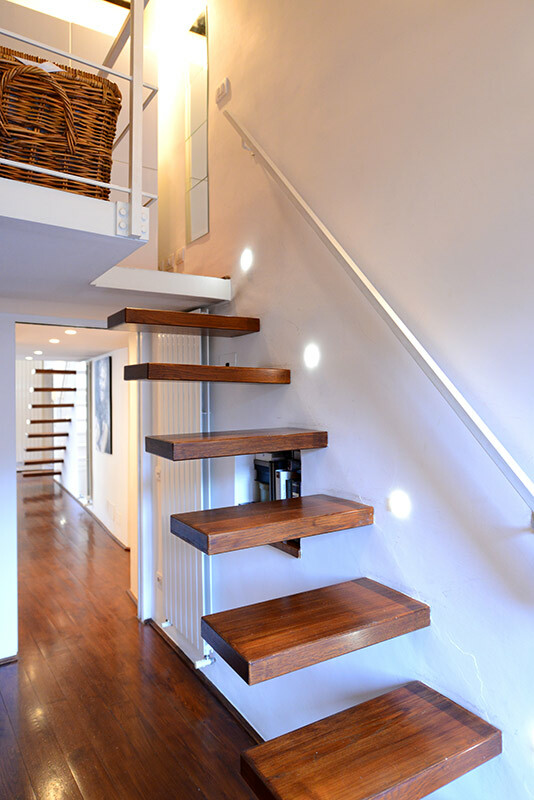 A modern designer staircase will lead you to the upper level where you’ll find a lovely studio with a desk and a double sofa bed. The fully-equipped kitchen provides all you might need, including gas stove, oven, fridge, freezer, dish washer and washing machine. The master bedroom is bright and spacious, featuring a king size bed, night tables, lamps and closets. Finally, the en suite bathroom has a shower. 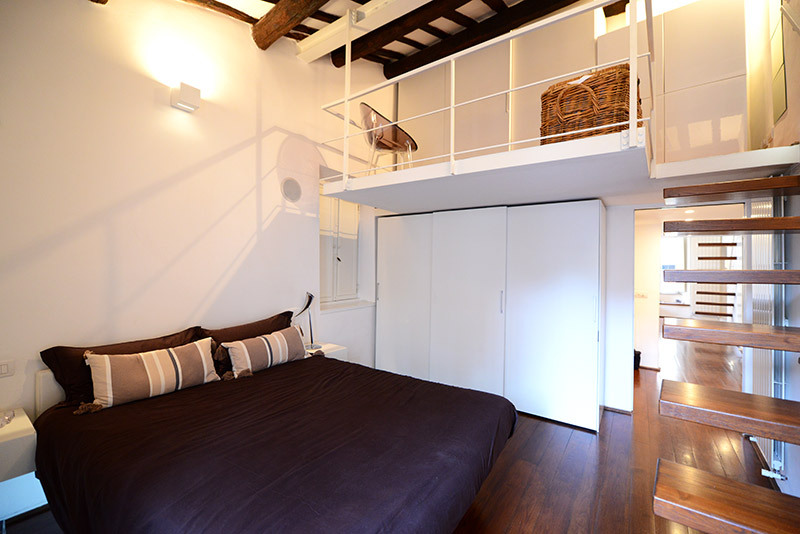 We recommend this fashionable unit for romantic stays. Trastevere is a perfect starting point for discovering the city! You can’t miss the famous Piazza di Santa Cecilia, especially by night when it’s illuminated by many torches. We also recommend having dinner at Ristorante la Gensola, just nearby. There are also many bars and restaurants which serve aperitivo. This Italian tradition is a great way to soak up the atmosphere and people watch whilst chatting the evening hours away. You will find yourself right in the middle of the historical center simply by crossing the Tiber River. On the other side you will find the Campo de’ Fiori area. This has a daily morning market selling fresh produce. It is also very lively at night, especially given its proximity to the Piazza Navona. This area also has many facilities, from restaurants and bars, to pharmacies, supermarkets, and banks. More importantly, from here you will be within walking distance of most of the major attractions. Especially near are the Pantheon, and the Castel Sant’Angelo. The apartment was as described online but a little sparse in terms of furniture for the living area. We request a sofa as there were just two small arm chairs and a plastic side chair. We rented the apartment for four months and would have thought these basic comforts would have been provided on arrival. Instead we had to several weeks before the s...Read Moreofa was delivered and the same for the microwave oven. Apart from this the staff have all been very polite, responsive and helpful. Thank you. 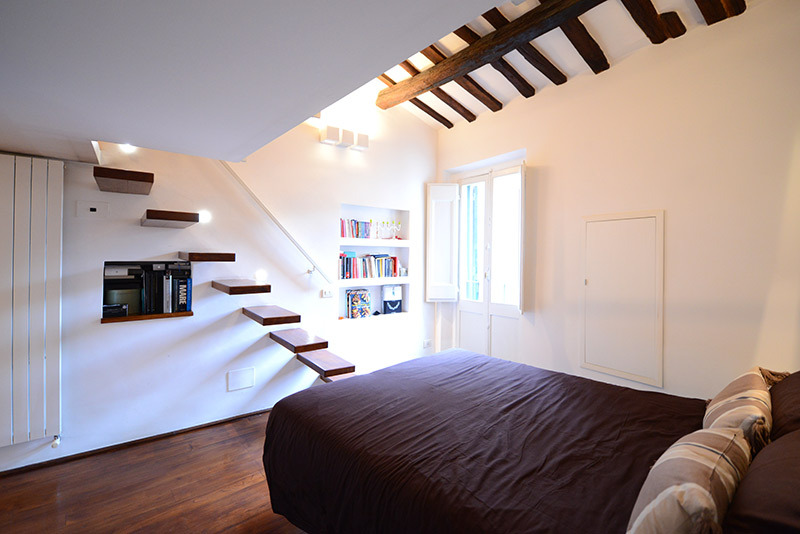 My wife and I absolutely loved our stay in the Trastevere stylish loft. The location was perfect, everything you could want on your doorstep, great restaurants, bars and cafes all within minutes walk. The apartment itself was exactly as described and we loved it. Will definitely be recommending and coming back on our next trip to Rome. All communic...Read Moreation was prompt, friendly and efficient - couldn't have asked for more! 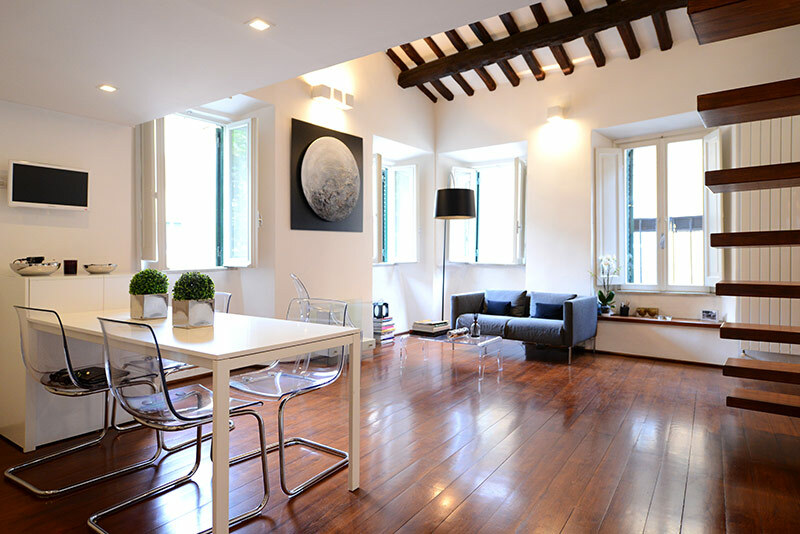 Trastavere stylish loft provided the perfect ambiance and location for our stay in Roma. 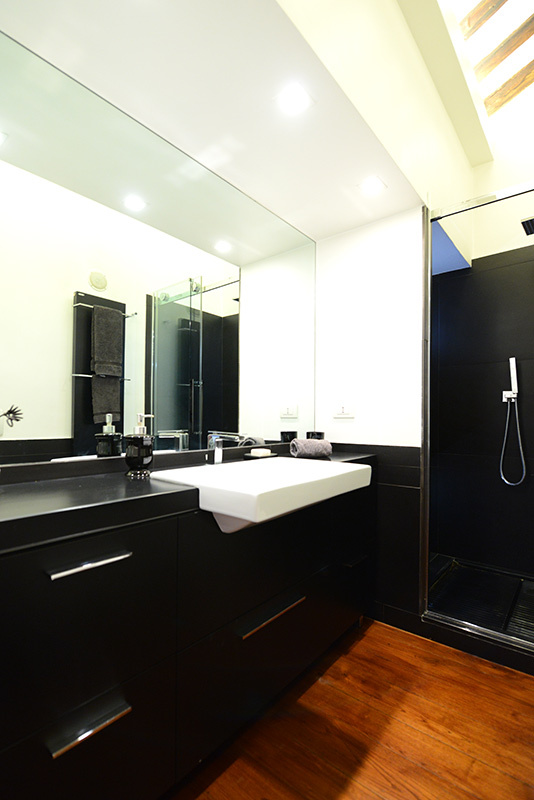 It is well equipped with plenty of room for ourselves with a clean, modern bathroom and great shower. The kitchen is fully equipped with gas stove and all amenities. A washer is available for use, but no drier. We did not need to use in any event. If you ...Read Moreare a person with any mobility issues or excessive luggage, you would not enjoy the climb up the four flights of stairs. 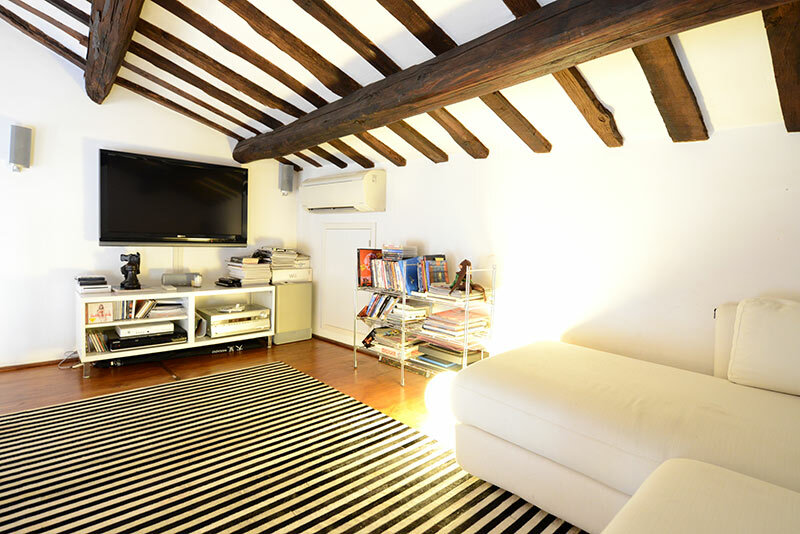 Their is a great upper area in the loft with a pull out couch, small library, and television for use (although we did not utilize this area as we were constantly on the go seeing the beautiful city). Restaurants are plentiful, and the district itself is definitely one of the coolest in the city...we walked much of the city centre area, so we are now very familiar with what was appealing. There are tourists, but the local flair is there without the masses you'll see in other popular parts of town. Wifi was generally good for connection. We cannot recommend close by transit connections as we again walked most of the city. A smaller sofa or love seat would be better to replace two of the smaller chairs in the common area as we had guests, and this would add to the quality of the room. They do arrange driver pickup and drop off to your destination or departure area, whether via plane, train or bus. We experienced some confusion with our pickup at Fiumicino airport, but that landed more so on our unfamiliarity with the airport and it's zones. It is well worth the extra euros (about 15 more euros than a flat rate cab) as the driver knows exactly where to take you...it is NOT recommended to try and find by auto, and parking in Rome would be challenging. We had a 4:30 am pickup to the airport, and the pickup service was spot on. All can be arranged through Lorenzo before your arrival. Great time, great studio, sad to be home, we will be back. Grazie Lorenzo! 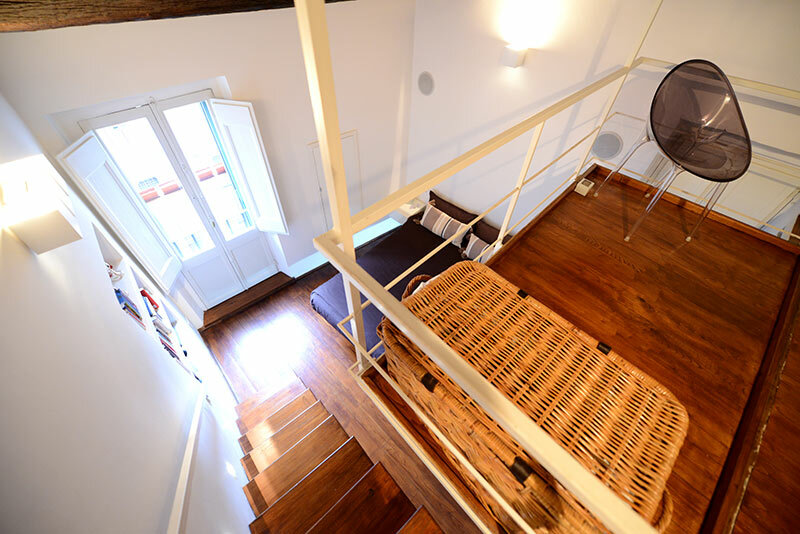 The apartment was really well located near the tram stop into the centre of Rome and a very short walk into the heart of the Trastevere district. It was comfortable and clean and spacious for myself, my husband and our 8 year old son. The air-con and internet all worked well. My suggestions would be to include a comfortable couch in the living are...Read Morea and also to equip the kitchen with some practical plates and bowls. 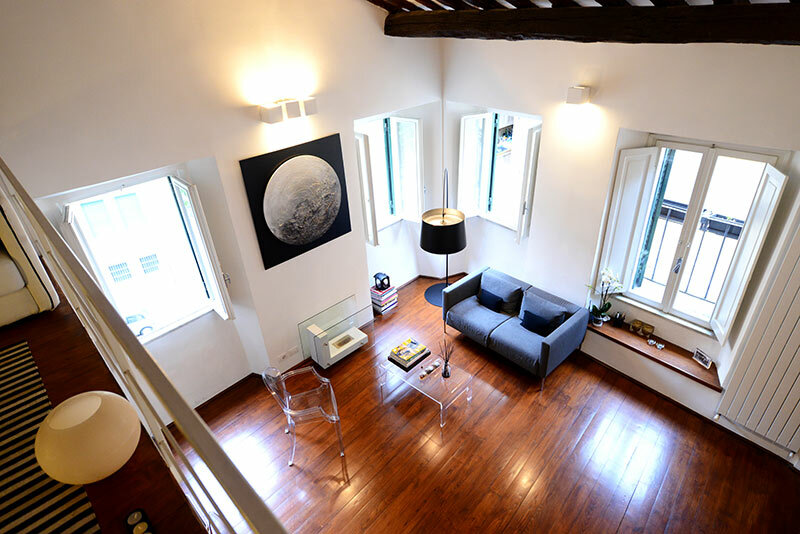 We loved the apartment positioned in the lovely quiet Trastevere area with most things in easy walking distance or transport close by. The only negative was the bedding as the fold out lounge where our 2 teenage daughters had to sleep was not really suitable for 2 people. Perhaps another foldout sofa in the loungeroom would offer extra comfort. I a...Read Morelso would have liked a microwave and a better stovetop coffee maker. Thank you to the staff to helped with our luggage.